For an unprecedented fourth straight season, theÂ Cleveland CavaliersÂ andÂ Golden State WarriorsÂ will face off in the NBA Finals. Here are 25 reasons Cavs-Warriors is a rivalry unlike any we've seen in sports. LeBron's arrival in the NBA was forecasted, telegraphed from Akron, Ohio, before he even reached high school. Stephen Curry sneaked to the top in the middle of the night when nobody was looking. Now every year is another opportunity for them to reaffirm their mutual dominance over the NBA's new golden age. Lest you forget, LeBron was the original modern unicorn -- a physical force of Russell's height, a wizard with the vision of Cousy and a rim-attacker who can fly like Erving. Yet as we watched LeBron master all skills, we became infatuated with one: the smooth, silky, 3-point shot. And nobody fired it with greater spontaneity, speed and joy than Curry. â€¢Â Cavs-Warriors IV was inevitable ... right? â€¢Â Finals Forecast: Who wins, who takes MVP? While James perfected the game, Curry defined it, and masters don't take kindly to those who mess with their trade. As Steph stepped into the spotlight a couple of years back, LeBron intimated that specialists don't warrant MVPs, and the two jawed at one another in the 2016 NBA Finals, when LeBron exacted revenge. Basketball has enough love to go around, but LeBron and Steph will forever battle over influence, over whose handprint left the most indelible impression over the game they both love. 2. Who has Warriors paranoia? Early in 2015-16, Cavs players would have the TV on when reporters entered their locker room after games in Cleveland. If the Warriors were playing that night, their game was frequently on the massive screen. While not all of the Cavs players would sit at their stalls and tune in, LeBron would hardly ever miss an opportunity to watch the new "darlings" of the NBA. When word began to spread that the Cavaliers were suffering from "Warriors paranoia," the team started turning off the TV or changing the channel prior to the media entering the locker room. From then on, the Cavs did their best to dispel the narrative that they were concerned about the Warriors. It was the finest moment of Matthew Dellavedova's career, but he could barely move. His entire body seized up in the cold tub after his 20-point explosion in Game 3 of the 2015 NBA Finals, and he was carried to a table, where several trainers tried to relieve massive cramping. Soon an IV was started and he ended up spending the night in the Cleveland Clinic. That was the toll that scoring 20 points and chasing Steph Curry around for 40 minutes took on him. By Game 6, a ball boy was sneaking into the media room to fetch Delly some coffee. But Delly went 0-for-3 as the Warriors won the title that night. Small ball is made for LeBron and Steph, and each asserts their dominance in this brave new world. Many a night, LeBron stands as the biggest player on the floor -- and the most skilled -- while Steph dominates from a perimeter stretched far too thin for a shot of his speed and exactitude. Small ball has been a gift for NBA fans, but even more so for dynamic players who, little did we know, just needed a little space to show off their supreme talents. When Steph's Warriors prevailed over the Cavs in 2015, it was now clear that not only could you get away with small ball, it was your best chance to conquer the modern NBA. The Warriors' offense was too overwhelming, and the versatility of a small-ball lineup actually helped craft a defense that could respond to any challenge. With that, the game was changed forever. Nobody's made a bigger difference in Cavaliers-Warriors matchups than Andre Iguodala. Incredibly, Cleveland has had the upper hand with Iguodala on the bench, outscoring Golden State by 47 points since 2014-15 (though the Cavaliers are minus-7 against those lineups this season). Put Iguodala on the court and the Warriors dominate: they're plus-218 (including plus-10 this season). Golden State made that change down 2-1 in the 2015 NBA Finals, when assistant coach Nick U'Ren suggested the Warriors start Iguodala in place of Andrew Bogut, giving rise to the "Death Lineup." Golden State won the next three games and Iguodala was named MVP. Iguodala also replaced Harrison Barnes as a starter in the 2016 NBA Finals, a testament to the value of his ability to defend LeBron James one-on-one. The hype surrounding Cavs-Warriors has been only amplified by the shade and #petty remarks both sides have engaged in. Do they hate each other? Not really. You still see their marquee players buddy up with USA Basketball. But there is a healthy level of annoyance, fueled in part by the fervent fans who inundate the timelines of players from the opposing team with trash talk year round. It's a mixture of entertainment and ego, and it's all rooted in pride as the two sides pass the conch back and forth. In January 2016, Cleveland was sitting atop the Eastern Conference standings with a 28-11 record, appearing destined to make it to the NBA Finals for the second consecutive season. But after a 34-point trouncing at home by Golden State on MLK Day, management convinced ownership that a coaching change was necessary. Cavs players who had given David Blatt a chance finally withdrew their support, too. For the Cavs, it wouldn't have mattered if they went 80-2 during the regular season. If those two losses were blowouts to the Warriors, it would have been viewed as unacceptable. Their goal was to win a championship. If they didn't have hope of beating the Warriors in the NBA Finals, the season would be a waste. Thus, Blatt was ousted a few days later. The speech:Â After being blown out in Game 2 of the 2016 NBA Finals, Cavs assistant coach Phil Handy asked to address the team. Normally a grinder who does his speaking in practices, the Oakland native stunned even his fellow coaches with a visceral rant in which he challenged the team to improve its focus. The players were moved by the moment and it was a building block for Game 3, which the Cavs won by 30. "WE HAVE SEEN NBA HISTORY IN THE MAKING EVERYDAY HERE. It's not "why not us?" It's "What the [expletive] else would we do?" We love it harder. We love it RECORD-SETTING. You know in your hearts and in your minds we have been the NBA DRAMA KINGS since we came together. I bet you can, and I'd love for you to add to this HISTORICAL DATABASE. What else speaks to you about the RECORD-SETTING insanity that has been YOUR CLEVELAND CAVALIERS! Let me be the first to tell you, NBA HISTORY HAS BEEN WAITING ON US." 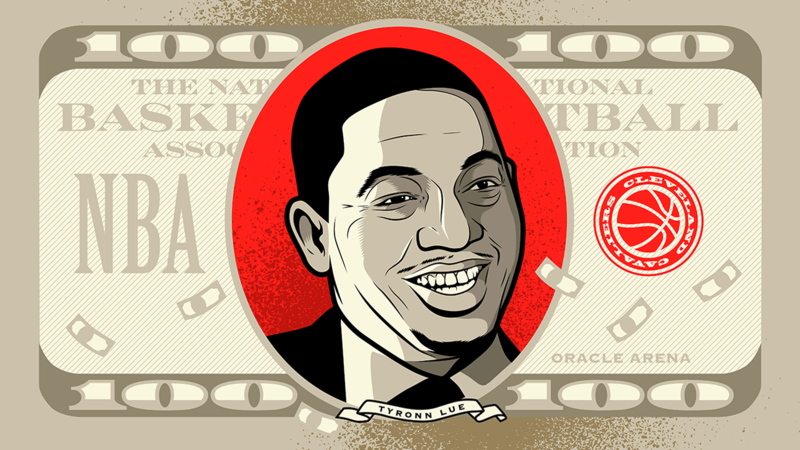 The money trick:Â Lastly, after winning Game 5, it was coach Ty Lue's turn. Copying a tactic from mentor Doc Rivers, Lue got in front of the team in the postgame locker room and asked for $100 from every player, coach and everyone in the traveling party, including the owners. When it was over, there was $5,500 in cash. Lue said the team would have to come back to get it, which meant they'd have to win Game 6 in Cleveland to come back for Game 7. He got on the desk in the coaches office and stuffed the envelope in the ceiling. He retrieved it six days later after the Game 7 victory. In the early-morning hours after the Warriors' Game 4 victory that made it 3-1 in the 2016 NBA Finals, James composed a group text and sent it to his teammates. "No matter how we got to this point, we're here now. We have to go to Golden State for Game 5 and we have to come home anyway. So why not come home and play a Game 6. Let it go, play hard, be focused, follow my lead, and I'll make sure you get home for a Game 6." Here was James' lead: He averaged 36.3 points, 11.7 rebounds and 9.6 assists in Games 5-7, arguably the finest three-game performance in his career, considering the circumstances. His triple-double in Game 7 at Oracle Arena was remarkable, and his blocked shot on Iguodala was iconic. The Cavs followed LeBron's lead, especially Kyrie Irving, and the team completed the greatest comeback in league history. Draymond Green watched Game 5 of the 2016 NBA Finals on a television from a suite at the Oakland Athletics game. NFL star Marshawn Lynch and Warriors general manager Bob Myers were by Green's side as he served a one-game suspension after punching LeBron James in the groin in Game 4. Myers didn't stick around long as he departed after center Andrew Bogut suffered a season-ending knee injury. Green's dream was to take a tunnel that connects the Oakland Coliseum to Oracle Arena and run to the floor in triumph as confetti fell from the rafters after the Warriors became 2016 NBA champions without him. But Green watched a nightmare unfold instead as the Warriors lost. James and the Cavaliers went on to win Game 6, too, to force a series-deciding contest in Oakland. While Green played arguably the game of his life in Game 7 with game-highs of 32 points and 15 rebounds, the injury-plagued Warriors ultimately fell to James and Irving. After Game 7, perhaps feeling guilty, Green texted Oklahoma City Thunder free agent Kevin Durant about joining the Warriors. On July 4, Durant set off fireworks by picking Golden State, quickly easing the pain of the Finals loss. It's hard to know where to start in explaining how absolutely nuts Game 6 of the 2016 Finals and everything around it was. Should we begin with the bus carrying the Warriors family and friends being significantly delayed from entering Quicken Loans Arena because they were stuck behind Jay-Z and BeyoncÃ©? Or NBA security detaining the father-in-law of two-time MVP Stephen Curry because he resembled a man who'd sneaked into several NBA games with fake credentials? Still waiting. At least 100 of us. Pulling in ... It's 9pm... Anywho... #LetsGoWarriors !!!!!!! Or how about LeBron James' epic block of Curry that just may have turned the series for good? We still haven't even mentioned Curry being ejected for throwing his mouthguard and hitting the son of a Cavs minority owner. Or Ayesha Curry's postgame Twitter rant, accusing the league of fixing games. Or the backlash that came after. But the most amazing thing is still this: The Cavs came back to force a Game 7 after being down 3-1 just a few days earlier. Four percent. Those were the chances that ESPN's Basketball Power Index gave the Cavaliers of digging out of the 3-1 hole and winning the 2016 NBA Finals after the final buzzer sounded following Game 4. Up until that point, teams to trail 3-1 in the Finals were 0-32 all time. Not only were the Cavaliers facing an uphill climb that no team had ever successfully navigated, they would have to do it against a record-setting 73-win juggernaut that lost two straight games only once the entire season. Impossible, right? The Block:Â After Irving missed a shot on the other end, Iguodala led a 2-1 break with Curry with only J.R. Smith ahead of the play. According to ESPN's Sport Science, James was 7 feet behind Iguodala when Curry dished it back to Iguodala for the layup. Traveling at more than 20 mph, James closed the gap and denied Iguodala, thus preserving a tie game with less than two minutes to go. This play swung the game in Cleveland's favor as the Cavaliers went from a 46 percent win probability to a 53 percent. The Dagger:Â When Lue called timeout with 1 minute, 9 seconds left and the game tied 89-89, the Cavaliers were a slightly better-than-coin-flip favorite to win Game 7. 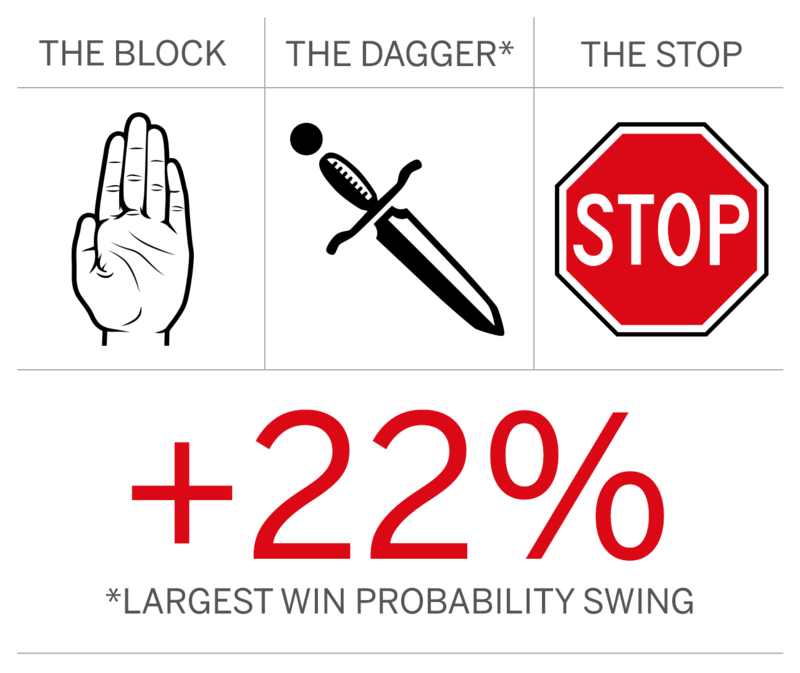 After Kyrie Irving's historic dagger, the Cavaliers odds of winning spiked all the way to 77 percent, a 22 percent swing that represented the largest play in a game littered with iconic moments. Taking into consideration the fact that it came with a championship on the line for both teams, a Wall Street Journal analysis concluded that it was, mathematically, the most clutch shot in NBA history in terms of swinging championship odds. The Stop:Â After Irving hit the 3-pointer to put the Cavaliers up 92-89, Curry got Kevin Love on a switch and tried twice to shake Love at the top of the key. For 15 seconds of game time, Curry danced with a flurry of crossovers and up-fakes, none of which caused Love to lose his footing. The best the league's MVP could muster was a contested 26-footer, which he missed. That would be the last time Golden State had the ball with a chance to tie. Curry's miss sent Cleveland's chance of winning from 77 percent to 87 percent. Since returning to Cleveland in 2014, LeBron has made an annual tradition of hosting a Halloween party. Players take months planning their costumes and spend thousands of dollars to try to one-up each another. In 2016, James' party planners set part of their budget aside to troll the Warriors with cookies in the shape of tombstones, commemorating Golden State's 3-1 Finals lead and unfulfilled 73-9 campaign. Plus, the piÃ¨ce de rÃ©sistance of the affair: a dummy dressed in a Steph Curry jersey laying on the ground by the entrance to the party that guests had to walk over in order to enter. Irving's turnaround game-winning jumper over Klay Thompson on Christmas Day in 2016 placed some doubt in the minds of the Warriors. The Cavaliers had now beaten them four straight times, including the last three games of the 2016 NBA Finals. Even with the newly signed Kevin Durant, it was the same result.Â Were they still not good enough? After the game, Steve Kerr was critical of Curry, challenging him to value ball security. A week later, Durant met with Curry and told him this was Curry's team, to play his game and he'd adjust to him. The Warriors cruised the rest of the way and went on to capture their second title in three years. It was the Christmas loss that proved to be the spark. 20. Superteams: Up, up and away! The 2017 NBA Finals was the 35th in league history to feature at least five All-Stars from that same season. 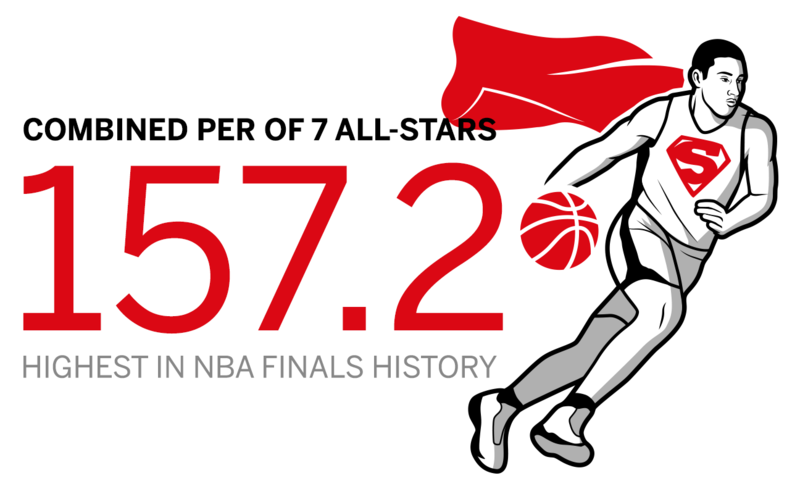 We took the player efficiency ratings from each of the All-Stars from those 35 series and added them up to create a "star-studded rating." Stephen Curry, Kevin Durant, Klay Thompson, Draymond Green, LeBron James, Kyrie Irving and Kevin Love -- all in their primes -- added up to 157.2, the best among that group and slightly ahead of the 1962 clash between the Lakers and Celtics, making it the most star-studded Finals in league history. The truth is that Kerr hasn't felt "good" since 2015, long before he had surgery on his back that began this nightmarish two years of health issues. Kerr has OK days and bad days. He doesn't really have good ones. But in the first round of the 2017 playoffs, he went from bad to curled up in bed, throwing up with terrible headaches and was unable to coach the team during the most important time of the season. Enter Mike Brown to coach the team during the playoffs, including the first game of the Finals against the Cavs, a team that had fired him twice in two separate stints over a five-year period but will still be paying him until 2020. It wasn't easy coaching somebody else's creation, let alone a team that's as close to perfect as the NBA has seen in decades -- if ever. But Brown approached it with a caretaker's mentality and guided the team to an 11-0 record until Kerr returned in Game 2 of the Finals. 22. LeBron passing torch to KD? Cleveland and Golden State will add another chapter to their recent rivalry that has already had many memorable moments. For at least the past five years, Kevin Durant has envisioned himself as the best basketball player in the game. After losing to LeBron James in the 2012 NBA Finals, he desperately wanted another shot. He knew he wouldn't be considered the league's top player without first dethroning James. Not only did he get his rematch in 2017, but his pull-up dagger 3-pointer over the outstretched hands of James in Game 3 sealed the game for the Warriors and instantly sparked debates over who was the league's best player today. Durant said he viewed it as a "passing the torch" moment. James surely doesn't view it the same way. After a cross-country flight from Las Vegas to Cleveland following Game 7 in 2016, James emerged from the team plane with the Larry O'Brien Trophy in his arms and an Ultimate Warrior T-shirt across his chest. Not to be outdone, Green took the logo for Quicken Loans -- Cavs owner Dan Gilbert's company and the title sponsor for the Cavs' home arena -- and changed the text to "Quickie" on a T-shirt he wore after the Dubs won in 5 games in 2017. 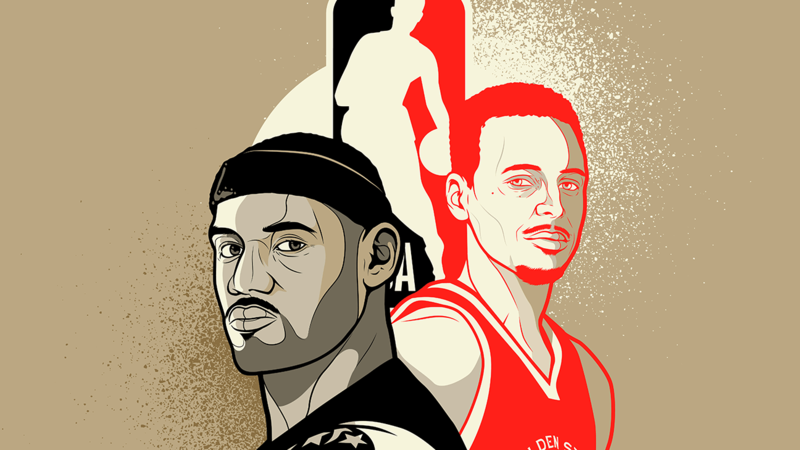 There is a long list of players who have played a part in the NBA's fiercest rivalry in decades. All told, 58 different players have suited up in this rivalry since 2014-15, 32 for the Cavs and 27 for the Warriors with Anderson Varejao donning both sets of threads. Only four players -- Klay Thompson, Andre Iguodala, Shaun Livingston and Tristan Thompson -- have appeared in each of the meetings so far. So how rare is this rivalry? Based on those percentages, you'd expect the same Finals matchup three years in a row about once every 32 years. It's a little surprising it had never happened before the Cavs and Warriors the previous three years. We'd expect teams to meet four consecutive times in the Finals only once every 185 years. 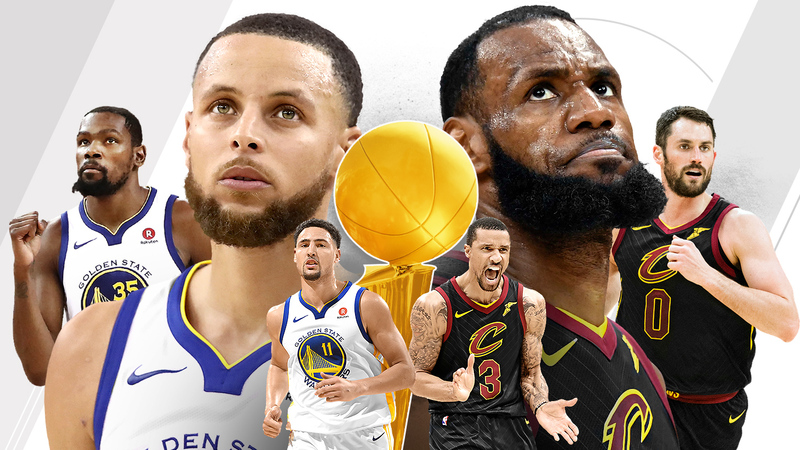 And with Cleveland and Golden State both winning Game 7s on the road, they've made history again -- four consecutive Finals matchups have not only never happened before in the NBA, but never in MLB, NFL or NHL history either.